← STOP PRESS: City Council in “no comment” shocker on Aviation trial! 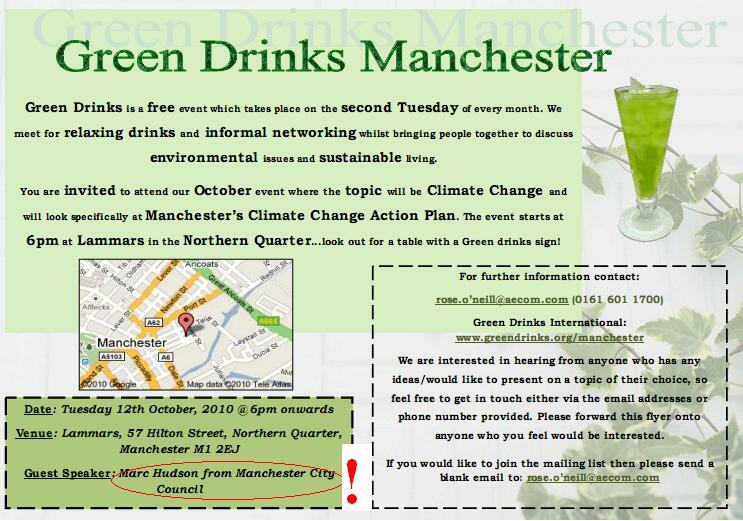 MCFly’s editor will be starting a discussion about the Manchester Climate Change Action Plan at the next “Green Drinks”, on Tuesday 12th October, from 6pm at Lammars, 57 Hilton St, in the Northern Quarter. Postcode M1 2EJ. The introductory provocative remarks will in part on this two page MCFly “bluffers’ guide to the Climate Change Action Plan“. As far as is known, Manchester City Council has never produced any similar explanatory document. Poor show, really. Why is it most of the Green Drink and environmental events are held at expensive venues? If the Manchester environmental movement want to engage with the wider public. Would it not be better to hold these events in a pub or bar that does not rip-off the customer as Lammars and Kro do. Or is this a policy of the middle-class elitists amongst Manchester’s environmental movement to deter those of us on low budgets and do not have any academic qualifications? Why is it most of the Green Drink and environmental events are held at expensive venues? “Most” Er, well, the Green Drinks is explicitly for businesses, so they’re not going to slum it, are they? And in my too-vast experience, most environmetnal events are held at the Friends Meeting House. Which doesn’t charge. If the Manchester environmental movement want to engage with the wider public. Would it not be better to hold these events in a pub or bar that does not rip-off the customer as Lammars and Kro do. Well a) I don’t think the “Manchester environmental movement” exists. There’s a scene- a bunch of groups running around like headless chickens. And I don’t think they want to engage with the wider public (though they SAY that they do). b) You aren’t forced to buy a drink at these places. They aren’t like grotty Soho strip clubs charging £25 for a glass of sparkling water. Or is this a policy of the middle-class elitists amongst Manchester’s environmental movement to deter those of us on low budgets and do not have any academic qualifications? Boff! A little bit of a chip on the shoulder there mate. I agree with you that the “scene” (as opposed to a “movement”) is chockful of over-empowered people with more money than class sensibility, but I am not aware of an actual *policy* on the matter. Anyway, you’re v. welcome at Lammars on Tuesday. You don’t need to buy anything. Even the handouts and the MCFlys will be free.